1. A preliminary assessment as to the nature of one of two primary structural forms within the blood anomalies has been reached. This effort has been necessary due to the failures of the Centers for Disease Control, the U.S. Environmental Protection Agency and the professional medical communities at large. The assessment is not final by any means, but due to its importance as an avenue for immediate investigation it is to be released. I am not offering or providing any medical advice or opinion in this report. I have no medical expertise and I claim none. Information provided here comes strictly from the position of analysis and observation. The assessment is that Chlamydiae or Chlamydiae-like organisms should be considered as a leading candidate for investigation in the Morgellon’s pursuit as well as in the investigation of the aerosol operations. A more detailed analysis of the rationale behind that assessment will be provided in another paper, Agents of Infection as time and circumstance permit. 2. The vast majority of all blood samples observed (if not all) are showing various degrees of anomalous form. The degree of damage to cellular integrity and form appears to correspond directly to the number of anomalous structures that are found within any individual sample. 3. The anomalies in a variety of blood samples have transcended the age factor, and they have now also been observed in the same fashion and form within the blood of a nine year old child. 1. The organism involved must measure on the order of sub-micron, generally on the order of 0.5 to 0.7 microns. 2. The organism is an intra-cellular organism, and can exist within human red blood cells (erythrocytes). 3. 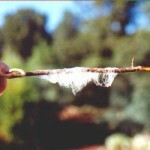 The organism is likely to be associated with respiratory conditions and is circulated by aerosol means. 4. The organism is spherical to oblate, but can can exist in more than one form (pleomorphic). 5. Gram stain procedures applied to the blood samples should produce a gram-negative result. 6. 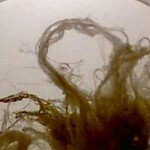 The same form, at least by inspection and measurement, should in general be present in diverse Morgellon physical samples, the airborne fibers under long term investigation (EPA refused) and the blood of Morgellon individuals. 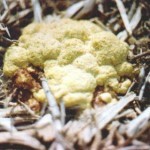 The general population may also demonstrate a marked presence of the pathogen. 7. The illnesses that are associated with the Chlamydiae genus should correlate with increasing and pervasive ailments and diseases. 8. Recorded observations of the pathogen must match the accumulated observations of this researcher. Considerable attention has been given to the consideration of alternative explanations, such as blood platelet imbalances, conventional bacterial and fungal forms; contradictions to one or more of the above conditions occur during those analyses. Although all pathogens remain under consideration a focus on Chlamydia-like groups is in place. The Chlamydiae-like group (with a special interest in Chlamydia pneumoniae) satisfies the above conditions to the degree that is understood. Again, this assessment is not intended to be final, but it is offered as the best assessment by this researcher to date. It is not unexpected that modification of a Chlamydia group could take place (e.g., mycoplasma combinations). In addition, the relationships to the second structural form (sub-micron filament network and bounding filaments) will need to be provided. One of the more normal appearing regions of red blood cells from a nine-year old child. Anomalous region of blood cells of nine year old child prior to the gram stain process. 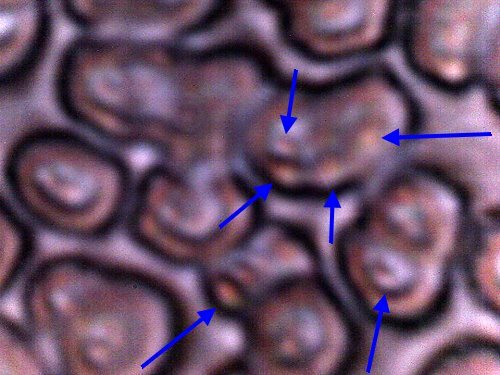 sub-micron structures are often visible(blue arrows) without any staining process involved. within, in contact with or adjacent to the blood cells. 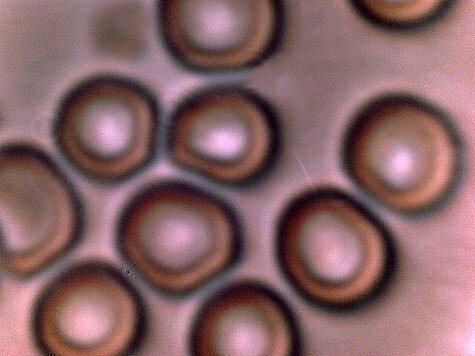 Numerous “double”-erythrocyte forms observed in this sample. visible examination of slide appears to show the gram negative process as highly dominant. 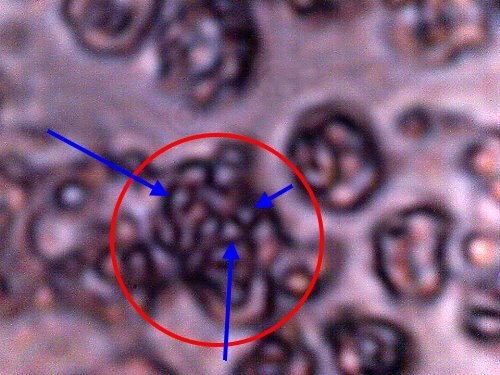 Area within circle encloses erythrocyte(red blood cell) boundary prior to stain process. Blood cell structure is damaged during the stain process(expected). Certain bacterial types or bacterial-like types(blue arrows) remain and are emphasized after the stain process. The intra-cellular (chylamidia-like) structures measure approx. 0.5 – 1.0 microns in diameter. crossovers with mycoplasma forms (also pleopmorphic) remain under strong consideration.